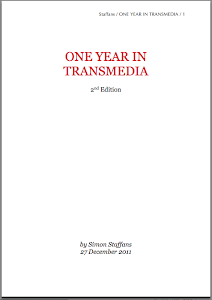 Transmedia storytelling is, at its core, simply that. By spreading out over different media and by creating a greater whole, we move deeper into the realms of transmedia. What it is, is basically the art and technique of telling a story, or rather multiple stories, connected directly or indirectly inside a larger story world and/or narrative superstructure and/or mythology. The second facet is also crucial, that of embracing the audience and bringing them into the story/stories, to sandboxes or cheese-holes or perhaps even to less structured, more open areas in the structure of the stories and the story world. This, of course, as many have discussed, profoundly changes the notion of an audience. Your audience is your audience, but at the same time they are your co-creators, investing themselves in your story and inevitably bringing change with them. It is then up to you, the creator, to choose just how much change you want. But generally, the more people invest, the closer they will feel to your content. Best case scenario, you not only have an audience and a horde of co-creators, you also have advocates that bring your stories to people in a fashion you yourself never could. The third facet is that of building sustainable financial structures, which have to be re-developed for each case, just as the stories and the worlds are re-developed for each new project. Transmedia projects have so many variables in play, that they inevitably become different from each other – more different than, say, television series or feature films. This leads to the creators needing to re-think the financing for every project; for sure there is a measure of recycling financing models from previous transmedia projects, but there will always be new possibilities in the context of a new project. This – sustainable financial structures – can take many shapes; from brands financing the lot to crowd sourced funding via IndieGoGo or a similar service. I firmly believe that to transmediate content opens up a whole lot of new possibilities to turn a project into a win-win-win situation, where you as a content creator win since you can tell more stories to more people in more ways, and get more and better (as in more fitting with your project) money in when you can play with a number of platforms and a number of stories. The brands or financiers win since you can target their message better, and since there is room for more financiers to partake - tv, online, books, mobile - the cost is less per participant with more bang for the buck as the end result. Finally the audience wins, as you have more money to make better content and make it available on more platforms to be even easier to obtain, engage and participate with and advocate for the audience. yep. needs all 3 to work. I offer community will be the key as things change in the next decade. I absolutely agree that projects / content without a community - of varying kinds - will have a harder time and struggle against those with an engaged community attached. Nice article, Simon! Funny how many projects get two out of three, but miss their potential without the third. yeah, I would be lying if I said I hadn't gone down that route myself a couple of times. Key is to fail really often and really really quickly, and draw the right conclusions.